Rob Field (in Ocean Beach/Point Loma--) 2525 Bacon St San Diego, CA 92107. Carpools leaving promptly at 10:00am . Moreno Street Park and Ride (in Oceanside/Carlsbad—at I-5 and Hwy 78) 1928 Moreno St., Oceanside 92054. Carpools leaving promptly at 10:00am . Trestles Parking . (929 S El Camino Real, San Clemente, CA 92672 (Next to Carl's Jr) Carpools leaving at 8:30am . A few items left in the benefit auction from Boost Mobile Pro. 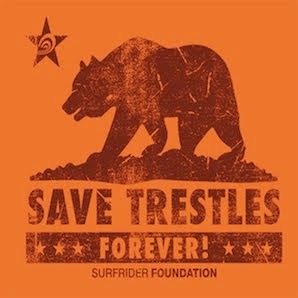 You saw Kelly Slater win the contest, now own the goods, and support Trestles and Surfrider. The toll road hearing, next Monday, Sept 22, is fast approaching. We need you to bring your friends and family! As we saw at the Coastal Commission hearing, when over 3,000 people show up and demand protection of San Onofre and Trestles, decision makers listen! We cannot let the Bush administration overturn a decision that has already been made in California. Get ready! It's time to gather and defend Trestles. Hopefully you have had a chance to read the hearing procedures: click here Hand-held sings need be a specific dimension (13 x 22 inches). Surfrider will be setting up sign-making stations to ensure everyone has "the right sized signs"; and we'll also be passing out signs already made. Since the hearing will go ‘all day', we are creating interactive stations and planning fun activities outside the hearing (such as, face painting for the kids, frisbee, hacky sack, and of course letter writing stations)! If you can't come for the entire day, please stop by for a bit--just coming for an hour or two CAN make a difference--at this point, public pressure is key to stopping this toll road. At the hearing, there will be "drop boxes" for letters and we need to fill them up! If you have friends who cannot come, please let them know you can hand-deliver a letter for them. Surfrider, and our partners, will be providing supporters with tee shirts and other goodies (first come, first served). Upon arriving, please check in at the welcome booth. During the hearing break (scheduled at 2pm), we are planning a rally with special speakers. We will also gather briefly after the hearing to re-cap the day and celebrate our efforts! Other "House Keeping Notes"... We are hoping the list of speakers will be published soon. You can check NOAA's website here: click here and click on "TCA". By Friday we'll be sending around "talking points" to assist you with your testimony (if you are chosen to speak). We have space in our bus/carpool. If you are coming from Orange County, email Robin: robin.everett@sierraclub.org. If you are in San Diego, email: savetrestles@surfrider.org and indicate if you would like to leave from Ocean Beach or Oceanside. If you are driving yourself, please note there is a $9 parking fee. Don't forget our street corner demonstration on Sunday before the hearing. September 21st--9am: Street San Elijo Ave and Chesterfield Dr, in Cardiff, CA. Meet us on the corner of San Elijo and Chesterfield in Cardiff, CA (near the Patagonia store). Patagonia Address: 2185 San Elijo Ave Cardiff By Sea, CA 92007. Thanks for your continued support and see you on Sept 22! The day of the hearing, Surfrider and its partners will be arranging carpools and buses. If you want to leave from San Diego please RSVP at: savetrestles@surfrider.org with the subject line: buses to hearing. Please indicate if you want a bus from North or South San Diego County. If you are coming from Orange County, email Robin at: robin.everett@sierraclub.org. We have several planned events and upcoming ways that you can plug into the campaign. This Friday, Sept 12, Rip Curl is hosting a BBQ fundraiser for the Save Trestles campaign. • Community Organizing Meeting: Join Surfrider and Sierra Club on Sept 17th at 7pm San Clemente Community Center to learn more about meeting procedures and the best way to have a successful hearing. Feel free to down load these posters and start hanging them and passing them out where every you go! We need to have thousands of people attend this hearing... and you can help us spread the word. The procedures for the hearing are a bit Byzantine--and you should know that not everyone who sends in a request will be allowed to speak. The Federal Government has assured us they will be fair by randomly picking individuals to speak. However, even if you are not chosen to testify, we need you to attend the hearing. A massive turn out is key to ensuring the California Coastal Commission decision is upheld. Please help us spread the word about the importance of attending this hearing! On the day of the hearing, Surfrider and its partners will be arranging carpools and buses. If you want to leave from San Diego please RSVP at: savetrestles@surfrider.org with the subject line: buses to hearing. Please indicate if you want a bus from North or South San Diego County. If you are coming from Orange County, email Robin at: robin.everett@sierraclub.org. Paddle for Clean Water: Both the Washington DC and San Diego Chapters are using their Paddle events to raise awareness about the toll road hearing. click here to see the happenings in San Diego, and click here for DC Paddle. Community Organizing Meeting: Join Surfrider and Sierra Club a few days before the hearing to learn more about meeting procedures and the best way to have a successful hearing. Time and Location TBD. Rally to Save Trestles—Help Raise Awareness About Sept 22 Public Hearing. Join Surfrider Foundation activists for public demonstrations to Save Trestles and San Onofre! The last few days and hours before the Secretary of Commerce hearing are crucial--and we must be highly visible! We'll be waiving signs, holding surf boards and constructing miniature tents to demonstrate how the toll road will ruin the camping and surfing experience at San Onofre State Beach. We need you there! We’ll have all the supplies; all you need to do is show up! September 7th—11am: Pico Ave, near Interstate 5, in San Clemente, CA. Meet us on the corner of San Elijo and Chesterfield in Cardiff, CA (near the Patagonia store).